(April 1, 2019) Surrounded by glitz and glamour and genuine Canadian stars of television and film, it’s easy to forget this is a serious business that involves billions of dollars, all kinds of risk, an impossible to calculate amount of work and the hopes and dreams of thousands of people in front of and behind the camera. It’s easy to pass the whole thing off as fake and phoney and of little consequence, an industry often defined by the phrase “smoke and mirrors.” And then back-to-back wins at an awards show by costars in a TV series remind you this is a very human endeavour and while the characters they play are just figments of someone’s imagination, the emotions and bonds formed by working together are very, very real. There on stage, live, in front of a packed Sony Centre in downtown Toronto as well as the audience watching at home, American-born all-but-Canadian actor Billy Campbell, clutching the first Canadian Screen Award of the evening, began to talk about what it was like to work on the series Cardinal, the name of the character he plays. He admitted in front of the world that his character pales next to his costar, Québec-born Karine Vanasse. And he choked up. On the verge of full-blown tears he apologized but his love for the work of his costar was overpowering and real and true. Vanasse, in her seat in the audience was also in tears. And then the next award was announced and it was hers. It was a special moment that, I hope, served to remind all of us that inside the characters we have come to love, or hate, or laugh at or root for, are real people. People who can not just touch us with their interpretations of completely fictional scenarios, but touch each other through their dedication, devotion and quality of their work. It was a hard act to follow but over the next couple of hours there were many touching moments: The Earle Grey Award for Mary Walsh, the Lifetime Achievement Award for the remarkable director Deepa Mehta, Jasmin Mozaffari winning the Best Director award for her first feature film Firecrackers, which just opened in select theatres on Friday. And then the impassioned speech by his brother honouring actor Stephan James with the very first Radius Award. 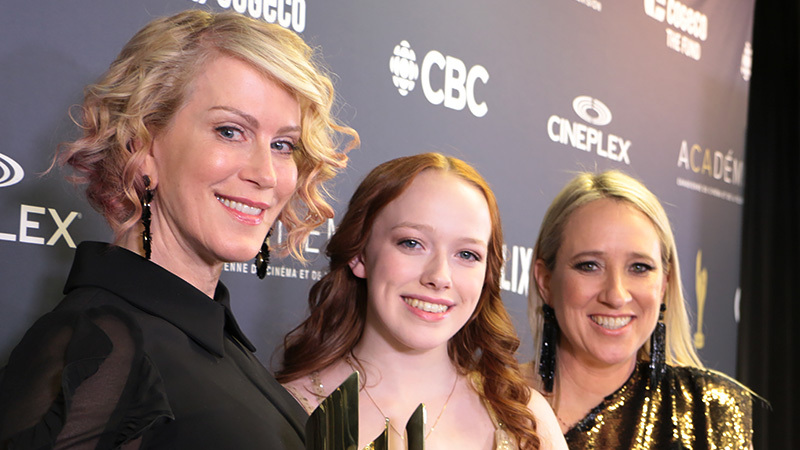 In cold statistics, Anne With An E and Cardinal each took 7 of the coveted Canadian Screen Awards during the 2019 Screen Week. As mentioned the costars of Cardinal won for their categories; Amybeth McNulty won for her work as Anne in Anne With An E. Kim Coates took an award for Best Lead Actor in a Drama Series for Bad Blood. Back stage in the media room Coates talked about how great Canadian production has become, especially on the small screen. Schitt’s Creek won for Best Comedy Series again, the night before production begins on the 6th and final season of the hit show. Finally, the award for Best Motion Picture went to A Colony, its original French title Une colonie for co-directors Fanny Drew and Sarah Mannering. There was some terrific glitz and many bright shining moments for an industry that exists simply because we, the great mass of us, are able to for moments or hours completely suspend disbelief. It’s all quite amazing. There’s a full list of Award-winners from the 2019 Broadcast Gala available online.